Sir Francis Bacon (1561 – 1626), 1st Viscount St. Alban, was an English philosopher and scientist who is most famous for his Baconian method which challenged the prevailing Aristotelian philosophy and shifted the focus of scientists to experimentation thus initiating a new intellectual era. Bacon was a prolific author who wrote on a range of subjects including science, law, philosophy, religion; and he even wrote fiction. His works continued to have an impact for centuries after his death and one of the repercussions was the formation of the renowned Royal Society of London. The most influential works of Bacon include Novum Organum, New Atlantis and The Advancement of Learning. He was also a prominent statesman and jurist who was a Member of Parliament and became Lord Chancellor, the highest position in England’s legal profession. Here are the 10 major accomplishments of Francis Bacon including his contributions to science. In 1582, Francis Bacon became an outer barrister; and in 1586, he became a bencher, a senior member of an Inn of Court in England. In 1587, he was elected as the Reader, a senior barrister of the Inn who was elected to deliver a series of lectures on a particular legal topic; and the following year, he delivered his first set of lectures in Lent. 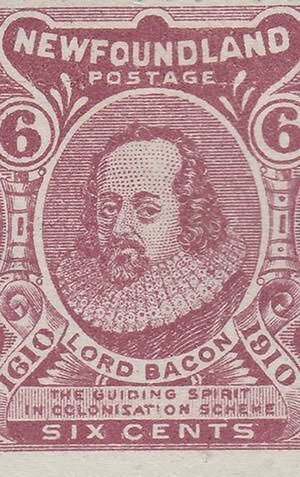 In 1596, Bacon became Queen’s Counsel, a lawyer appointed by the Queen to be one of “Her Majesty’s Counsel learned in the law.” His career took off after James I became King of England in 1603. In 1613, he was appointed to the prestigious post of Attorney General. In 1618, at the age of 56, Francis Bacon was made Lord Chancellor, the highest position in England’s legal profession and one of the most powerful posts in the country. The political career of Francis Bacon began in 1581 at the age of 20 when he was elected Member of Parliament for Bossiney, Cornwall, in a by-election. In 1584 he took his seat in parliament for Melcombe in Dorset, and in 1586 for Taunton. He then became MP for Liverpool in 1588; for Middlesex in 1593; for Ipswich in 1597, 1601 and 1604; and for Cambridge University in 1614. James I succeeded Elizabeth I to the throne of England in 1603. Bacon, who had been generally neglected at the court of Queen Elizabeth, became a close aid to the new king. In the very year of his succession, 1603, James I knighted him. 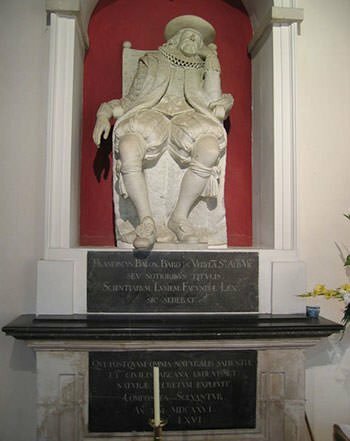 On 12th July 1618, Sir Francis Bacon was created 1st Baron Verulam and on 27th January 1621, 1st Viscount St. Alban. He also served as regent of England for a month in 1617. Francis Bacon was a prolific writer. He proposed reformation of all process of knowledge for the advancement of learning divine and human in his work Instauratio Magna (The Great Instauration). He divided this work into six parts, imitating the Work of the Six Days of Creation. The six books in The Great Instauration include his renowned works Novum Organum and The Advancement of Learning. His literary and religious works include New Atlantis, Essays, The Wisdom of the Ancients, Masculine Birth of Time, a collection of religious meditations and a collection of prayers. Being a jurist by profession, he also wrote several works to reform the law including The Elements of the Common Laws of England, Maxims of the Law, Cases of Treason and The Learned Reading of Sir Francis Bacon upon the Statute of Uses. At the time of Francis Bacon and for many centuries before him, science or natural philosophy in Europe was dominated by the works of Aristotle. Most scholars revered Aristotle and their attitude that his theories were unquestionable had led to stagnation in the development of science. 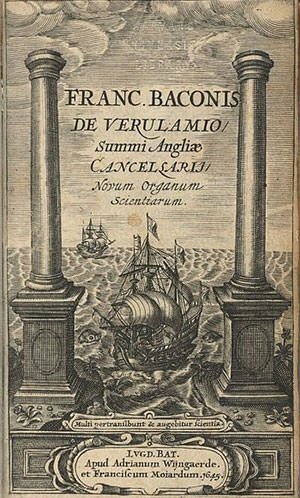 The most influential work of Francis Bacon, Novum Organum Scientiarum (‘new instrument of science’) was published in 1620. In it, Bacon rejected Aristotelian philosophy and came up with his famous Baconian method, which used inductive reasoning to arrive at facts after careful observation of events. This method was influential upon the development of the scientific method in modern science. Bacon is thus referred to as the father of the scientific method, by which laws of science are discovered by gathering and analysing data from experiments and observations. The Baconian method which was put forward by Francis Bacon in Novum Organum, requires careful, systematic observations to produce quality facts; use of induction to generalize these facts to one or more axioms, taking care not to generalize more than what the facts truly demonstrate; and repeating the process to arrive at a base of knowledge by empirical data. Bacon’s process allowed researchers to set aside old superstitions, over-generalizations and unproven facts leading to a scientific revolution. Many scientists, most notably the famous chemist Robert Boyle, soon used the principles of Bacon to make path breaking discoveries. Bacon’s emphasis on the use of experiments to provide observances of a phenomenon is one of the reason he is considered “the Father of the Experimental Philosophy”. 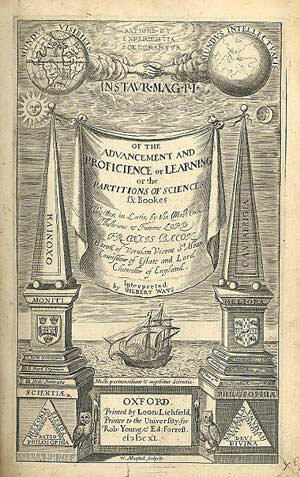 Bacon’s 1605 book The Advancement of Learning divided human understanding in three parts: history, related to man’s faculty of memory; poetry, related to man’s faculty of imagination; and philosophy, pertaining to man’s faculty of reason. He then further divided these three parts based on three aspects: divine, human and natural. This work was later expanded and published as De Augmentis Scientiarum (Partitions of the Sciences). The classifications used in The Advancement of Learning inspired the taxonomic structure of the highly influential Encyclopédie, published in France between 1751 and 1772. In 1623, Bacon’s History of Life and Death was published. This work is a treatise on medicine which looks into the causes of the degeneration of the body and old age, taking into consideration different analysis, theories and experiments, to find remedies to prolong life. This book was one of Bacon’s most well regarded works at the time of its publication. Francis Bacon’s propositions of legal reform, though not established in his lifetime, are considered to have been one of the influences behind the Napoleonic Code, which is regarded as one of the most influential legal documents in world history. Bacon is credited for the establishment of several features in the modern common law system including using cases as repositories of evidence about the “unwritten law”; and determining the relevance of precedents by exclusionary principles of evidence and logic. He is thus acknowledged as the inventor of the process of discovering unwritten laws from the evidences of their applications. Some jurists consider Bacon as the father of modern Jurisprudence, the science, study and theory of law. 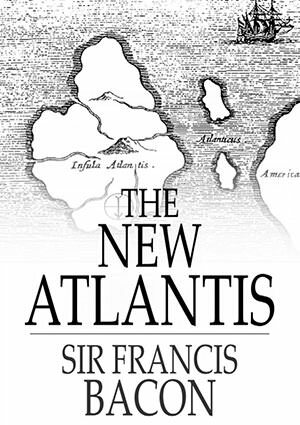 New Atlantis is an incomplete utopian novel by Francis Bacon. It was published in 1627, a year after his death. In New Atlantis, Bacon expressed his vision of the future of human discovery and knowledge through a utopian land which values “generosity and enlightenment, dignity and splendour, piety and public spirit”. The plan and organisation of his ideal college, Salomon’s House, envisioned the modern research university in both applied and pure sciences. 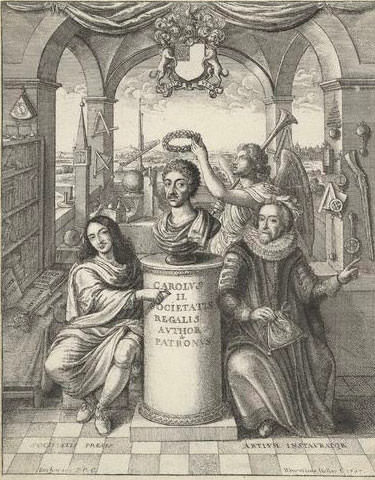 Bacon’s scientific method as well as New Atlantis, particularly its idea of Salomon’s House, inspired his followers, like Samuel Hartlib and Robert Boyle, to found the Royal Society of London. The Royal Society, was hugely influential in the development of science in Europe and continues to play a part by, among other things, promoting science and recognising excellence in scientific fields. Francis Bacon played a leading role in creating the English colonies in North America, especially in Virginia, the Carolinas and Newfoundland. Until he became a prominent member of the Virginian Council, all attempts to make a permanent settlement there had ended in disaster. William Strachey, the first secretary of the Colony, addressed Bacon as “a most noble father of the Virginian Plantation.” Some scholars believe that he was also largely responsible for the drafting of two charters of government for Virginia, which were the beginning of constitutionalism in America. In 1910, Newfoundland, commemorating the three hundredth anniversary of its foundation, issued a postage stamp to commemorate Bacon’s role in establishing the province. It addressed Bacon as “the guiding spirit in colonization scheme” of 1610. Francis Bacon is considered a “universal genius“ who made important contributions in a number of fields. He was a philosopher, statesman, scientist, jurist, orator and author. Bacon was the leading figure in the field of scientific methodology whose work played a key role in the transition in Europe from the Renaissance to the early modern era. He is thus credited for no less than being a key figure in initiating a new intellectual era. The Royal Society and other scientific institutions applied his scientific approach and followed the steps of his reformed scientific method; and numerous scientists and thinkers were influenced by his works. Francis Bacon was included in the list of the 100 most influential people of the last millennium by A&E Networks.